Which Filler is Best..... Buckwheat, Flax, Rice, Wheat or Corn? Eco-friendly, reusable Heating Pads for the Microwave come in all shapes and sizes. So when we began brainstorming ideas in 2001 we experimented with different heating pad sizes and filler materials. 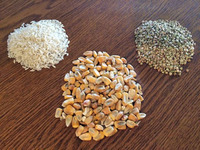 We tested Rice & Flax as well as Corn when choosing the best filling for our microwave heating pads. When we tested different filler materials, the results were quite surprising. We found that rice and other small materials required significantly more material to produce the same therapeutic warm feeling that deer corn produced. Unfortunately for rice and flax, this extra filler meant that the heating pad was filled quite full - it felt like we were holding a hard cloth bag next to our body. This simply would not work! This problem was really evident on the neck warmer because of the smaller pocket sizes. The other benefit corn offers is the way it moves inside the inner bag. Because of the size of the corn kernel, it moves freely so that when you put the bag next to your body, the corn naturally conforms to you resulting in a very comfortable product. Based upon our testing and the feedback from our customers, we feel that our Corn Bag Heating Pads are the best heating pads for a sore neck and back and they work wonderfully for those times you need to warm up!